A contending playoff team usually excels against subpar competition, particularly within the division. The Phillies, however, faltered against lackluster foes in the NL East and that's a significant reason why their postseason aspirations now seem so far fetched. Michael Conforto crushed a three-run homer in the ninth inning on Monday, sealing a Mets 9-4 win over the Phillies at Citizens Bank Park. With the win, the Mets have beaten the Phillies in 11 of the 17 contests played between the two clubs this season. "They've just flat out beat us," manager Gabe Kapler said afterward (see video). "They have beat us in good matchups. They have beat us in bad matchups. They have just handled us well ... I feel it's appropriate to tip our caps to the job they've done against our pitchers." Zach Wheeler tossed seven innings for the Mets en route to his 12th win of the season. He surrendered four runs on a combination of three hits and three walks. 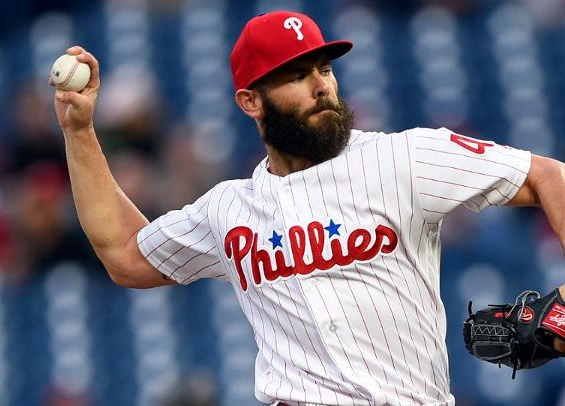 Jake Arrieta was roughed up by the Mets, scattering nine hits over five innings while surrendering four runs. His ERA over his last seven starts in 6.03. Trailing 4-0 in the home portion of the fifth, the Phillies answered with J.P. Crawford's three-run triple highlighting a four-run frame. Ceasar Hernandez chipped in with a sacrifice fly to even the contest at 4-4. Conforto came through for the Mets though in the seventh, drilling a Tommy Hunter cutter to right field for a double while driving in Amed Rosario with what ultimately was the game-winning run. The six RBIs on the night for Conforto marked a career-high. Thirteen games remain for the Phillies, and they trail the first-place Braves by 6 1/2 games in the NL East. The window on the postseason is less than an inch from closing altogether on Kapler's rookie season. Asdrubal Cabrera left the contest in the sixth with a strained left calf. Kapler said Cabrera mentioned some soreness the inning prior, but said he could remain in the game. That mindset changed though after he was hit by a pitch just below the left ankle. He'll be further evaluated on Tuesday. Aaron Nola will toe the rubber for the Phillies on Tuesday, aiming to improve on what's already been an outstanding 2018 campaign. He's struggled a bit as of late with the long ball, but still has an outside shot to earn some NL Cy Young Award votes with another quality start. The Mets counter with left Steven Matz.